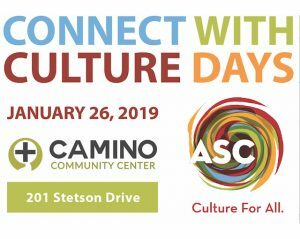 Explore arts, science and history experiences at 19 locations across Mecklenburg County on Jan. 25-26, including the Camino Community Center in University City on Jan. 26. Organized by the Arts and Science Council, Connect with Culture Days feature scores of activities by dozens of arts, science and history groups. At the Camino Center, sample Afro-Brazilian dance, make friendship blankets, hear a Mariachi band and more. Participate in a literacy workshop, developed by ASC, that teaches adult caregivers how to be more eﬀective when reading with children. Registration is required. Click Here to Register for 10 a.m.
Click Here to Register for 11:30 a.m.
Click here for the full schedule of activities taking place Jan. 25-26 throughout Mecklenburg County.